The Treaty between the United States of America and the French Republic. The Louisiana was an immense country reaching to the Rocky Mountains. President Jefferson's purchase doubled the size of the United States and included the entire Mississippi River, city of New Orleans and St. Louis. Note: The three documents transcribed here are the treaty of cession and two conventions, one for the payment of 60 million francs ($11,250,000), the other for claims American citizens had made against France for 20 million francs ($3,750,000). The President of the United States of America and the First Consul of the French Republic in the name of the French People desiring to remove all Source of misunderstanding relative to objects of discussion mentioned in the Second and fifth articles of the Convention of the 8th Vendé miaire an 9/30 September 1800 relative to the rights claimed by the United States in virtue of the Treaty concluded at Madrid the 27 of October 1795, between His Catholic Majesty & the Said United States, & willing to Strengthen the union and friendship which at the time of the Said Convention was happily reestablished between the two nations have respectively named their Plenipotentiaries to wit The President of the United States, by and with the advice and consent of the Senate of the Said States; Robert R. Livingston Minister Plenipotentiary of the United States and James Monroe Minister Plenipotentiary and Envoy extraordinary of the Said States near the Government of the French Republic; And the First Consul in the name of the French people, Citizen Francis Barbé Marbois Minister of the public treasury who after having respectively exchanged their full powers have agreed to the following Articles. There Shall be Sent by the Government of France a Commissary to Louisiana to the end that he do every act necessary as well to receive from the Officers of his Catholic Majesty the Said country and its dependences in the name of the French Republic if it has not been already done as to transmit it in the name of the French Republic to the Commissary or agent of the United States. 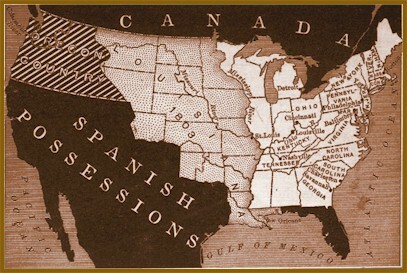 As it is reciprocally advantageous to the commerce of France and the United States to encourage the communication of both nations for a limited time in the country ceded by the present treaty until general arrangements relative to commerce of both nations may be agreed on; it has been agreed between the contracting parties that the French Ships coming directly from France or any of her colonies loaded only with the produce and manufactures of France or her Said Colonies; and the Ships of Spain coming directly from Spain or any of her colonies loaded only with the produce or manufactures of Spain or her Colonies shall be admitted during the Space of twelve years in the Port of New-Orleans and in all other legal ports-of-entry within the ceded territory in the Same manner as the Ships of the United States coming directly from France or Spain or any of their Colonies without being Subject to any other or greater duty on merchandize or other or greater tonnage than that paid by the citizens of the United. States. The Government of the United States engages to pay to the French government in the manner Specified in the following article the sum of Sixty millions of francs independant of the Sum which Shall be fixed by another Convention for the payment of the debts due by France to citizens of the United States. For the payment of the Sum of Sixty millions of francs mentioned in the preceeding article the United States shall create a Stock of eleven millions, two hundred and fifty thousand Dollars bearing an interest of Six per cent: per annum payable half y early in London Amsterdam or Paris amounting by the half year to three hundred and thirty Seven thousand five hundred Dollars, according to the proportions which Shall be determined by the French Government to be paid at either place: The principal of t he Said Stock to be reimbursed at the treasury of the United States in annual payments of not less than three millions of Dollars each; of which the first payment Shall commence fifteen years after the date of the exchange of ratifications:--this Stock Shall be transferred to the government of France or to Such person or persons as Shall be authorized to receive it in three months at most after the exchange of ratifications of this treaty and after Louisiana Shall be taken possession of the name of the Government of the United States. It is agreed that the Dollar of the United States Specified in the present Convention shall be fixed at five francs 3333/100000 or five livres eight Sous tournois. The President of the United States of America and the First Consul of the French Republic in the name of the French People having by a Treaty of this date terminated all difficulties relative to Louisiana, and established on a Solid foundation the friendship which unites the two nations and being desirous in complyance with the Second and fifth Articles of the Convention of the 8th Vendé miaire ninth year of the French Republic (30th September 1800) to Secure the payment of the Sums due by France to the citizens of the United States have respectively nominated as Plenipotentiaries that is to Say The President of the United States of America by and with the advise and consent of their Senate Robert R. Livingston Minister Plenipotentiary and James Monroe Minister Plenipotentiary and Envoy Extraordinary of the Said States near the Government of the French Republic: and the First Consul in the name of the French People the Citizen Francis Barbé Marbois Minister of the public treasury; who after having exchanged their full powers have agreed to the following articles. The debts due by France to citizens of the United States contracted before the 8th Vendé miaire ninth year of the French Republic/30th September 1800/ Shall be paid according to the following regulations with interest at Six per Cent; to commence from the period when the accounts and vouchers were presented to the French Government. The debts provided for by the preceeding Article are those whose result is comprised in the conjectural note annexed to the present Convention and which, with the interest cannot exceed the Sum of twenty millions of Francs. The claims comprised in the Said note which fall within the exceptions of the following articles, Shall not be admitted to the benefit of this provision. The principal and interests of the Said debts Shall be discharged by the United States, by orders drawn by their Minister Plenipotentiary on their treasury, these orders Shall be payable Sixty days after the exchange of ratifications of the Treaty and the Conventions Signed this day, and after possession Shall be given of Louisiana by the Commissaries of France to those of the United States. The preceding Articles Shall apply only, First: to captures of which the council of prizes Shall have ordered restitution, it being well understood that the claimant cannot have recourse to the United States otherwise than he might have had to the Government of the French republic, and only in case of insufficiency of the captors--2d the debts mentioned in the Said fifth Article of the Convention contracted before the 8th Vendé miaire an 9/30th September 1800 the payment of which has been heretof ore claimed of the actual Government of France and for which the creditors have a right to the protection of the United States;-- the Said 5th Article does not comprehend prizes whose condemnation has been or Shall be confirmed: it is the express intenti on of the contracting parties not to extend the benefit of the present Convention to reclamations of American citizens who Shall have established houses of Commerce in France, England or other countries than the United States in partnership with foreigner s, and who by that reason and the nature of their commerce ought to be regarded as domiciliated in the places where Such house exist.--All agreements and bargains concerning merchandize, which Shall not be the property of American citizens, are equally excepted from the benefit of the said Conventions, Saving however to Such persons their claims in like manner as if this Treaty had not been made. And that the different questions which may arise under the preceding article may be fairly investigated, the Ministers Plenipotentiary of the United States Shall name three persons, who Shall act from the present and provisionally, and who shall have full power to examine, without removing the documents, all the accounts of the different claims already liquidated by the Bureaus established for this purpose by the French Republic, and to ascertain whether they belong to the classes designated by the present Convention and the principles established in it or if they are not in one of its exceptions and on their Certificate, declaring that the debt is due to an American Citizen or his representative and that it existed before the 8th Vendé miaire 9th year/30 September 1800 the debtor shall be entitled to an order on the Treasury of the United States in the manner prescribed by the 3d Article. The Same agents Shall likewise have power, without removing the documents, to examine the claims which are prepared for verification, and to certify those which ought to be admitted by uniting the necessary qualifications, and not being comprised in t he exceptions contained in the present Convention. The Same agents Shall likewise examine the claims which are not prepared for liquidation, and certify in writing those which in their judgment ought to be admitted to liquidation. In proportion as the debts mentioned in these articles Shall be admitted they Shall be discharged with interest at Six per Cent: by the Treasury of the United States. And that no debt shall not have the qualifications above mentioned and that no unjust or exorbitant demand may be admitted, the Commercial agent of the United States at Paris or such other agent as the Minister Plenipotentiary or the United States Shall think proper to nominate shall assist at the operations of the Bureaus and cooperate in the examinations of the claims; and if this agent Shall be of the opinion that any debt is not completely proved, or if he shall judge that it is not comprised in t he principles of the fifth article above mentioned, and if notwithstanding his opinion the Bureaus established by the French Government should think that it ought to be liquidated, he shall transmit his observations to the board established by the United States, who, without removing documents, shall make a complete examination of the debt and vouchers which Support it, and report the result to the Minister of the United States.--The Minister of the United States Shall transmit his observations in all Such cases to the Minister of the treasury of the French Republic, on whose report the French Government Shall decide definitively in every case. Every necessary decision Shall be made in the course of a year to commence from the exchange of ratifications, and no reclamation Shall be admitted afterwards. In case of claims for debts contracted by the Government of France with citizens of the United States Since the 8th Vendé miaire 9th year/30 September 1800 not being comprised in this Convention may be pursued, and the payment demanded in the Same manner as if it had not been made. The present convention Shall be ratified in good and due form and the ratifications Shall be exchanged in Six months from the date of the Signature of the Ministers Plenipotentiary, or Sooner if possible.